And if you go to see Prometheus, Ridley Scott’s unofficial prequel to his Alien series, you will no doubt say that quite a few times. We’re plopped down pretty quickly in Scotland, in the year 2089, where two archeologists, Elizabeth Shaw and Charlie Holloway (played by the Swedish Lisbeth Salander, Noomi Rapace, and Logan Marshall-Grant, previously best known for playing Trey Atwood on The O.C. ), have stumbled upon a star map that they think will lead them to the secret of life. They interpret this as an invitation to go find the so-called Engineers, who “created” the human race. Suffice it to say, things go wrong. Weapons are most definitely needed, and not every crew member makes it to the end credits. Now is probably as good a time as any to admit that I’ve never seen any of the prior Alien movies, so while others in the audience chuckled at various references made throughout the film, I saw Prometheus on its own terms. And that’s not a problem if you’re in a similar boat as I am. After all, it’s easy to appreciate lines of dialogue like “I didn’t think you had it in you” even if you have the bare minimum of knowledge about what happened in the other films. 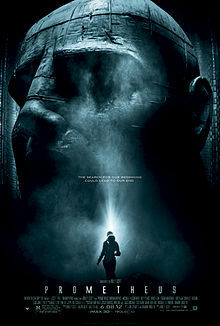 Anyway, Prometheus is pretty damned cool movie. There are some impressive special effects, as noted some great use of 3D, and the film, despite its cold settings, is just gorgeous to look at. 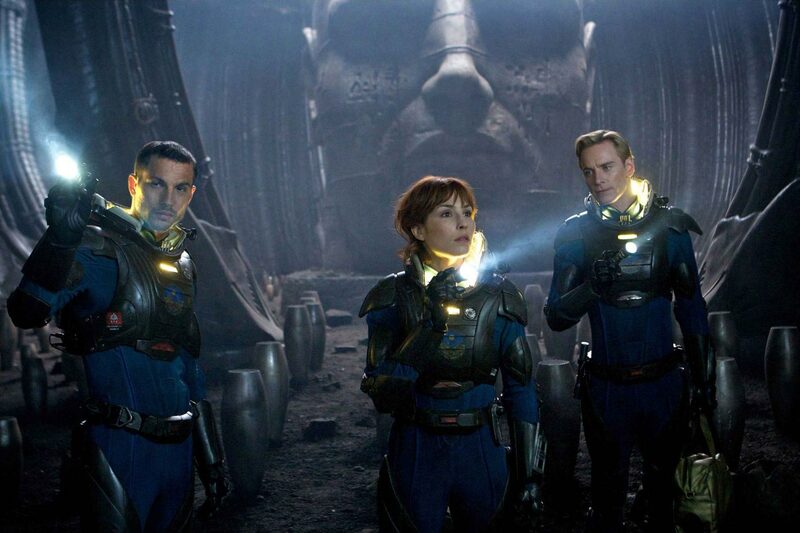 Of course, it doesn’t hurt that Prometheus has an attractive cast. For example, there’s Theron, who here actually seems a bit wooden; that’s unintentional. Michael Fassbender, on the other hand, gives an intentionally stiff performance, but that’s because he’s playing a robot. And despite that, he’s one of the best and coolest things about Prometheus. As David, he’s smarter than the average bear, and a bit more devious too, despite his taking grooming, diction, and behavioral cues from, of all things, the film Lawrence of Arabia. What are his motivations? Does he even understand what his purpose is? Who knows. But you can’t take your eyes off him whenever Fassbender’s on the screen. Scott keeps the action moving, throwing one thrilling set piece after another at us. Not everything works, but when it does — the scene where Shaw has to perform emergency surgery on herself, for example — it’s awesome. This is a big, slick, impressively made film that surely and confidently entertains. 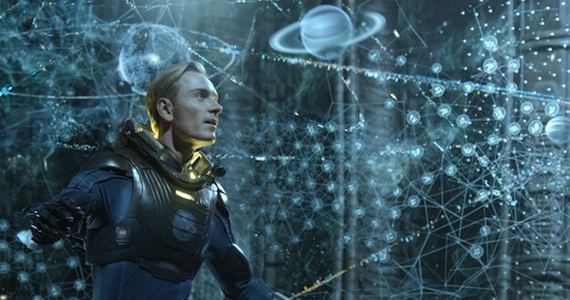 Ultimately, Prometheus doesn’t resolve a lot of the questions it asks about where we come from as much as it excites and exhausts the audience. But considering the original 1979 Alien film was set about 100 years after this one, something tells me there’ll be another film sometime soon that will get us closer to the answers. I’m giving Prometheus a B+. Up until this point I wasn’t planning on seeing this. Thanks for the review.